← Authentic NYC Black and White Cookies! About a month ago, I started going on Reddit, a site with all sorts of fun and interesting things found on the internet. There are sub-readits based on people’s interests, and one of my favorites is “breadit,” dedicated to all things bread! Don’t you love the name? 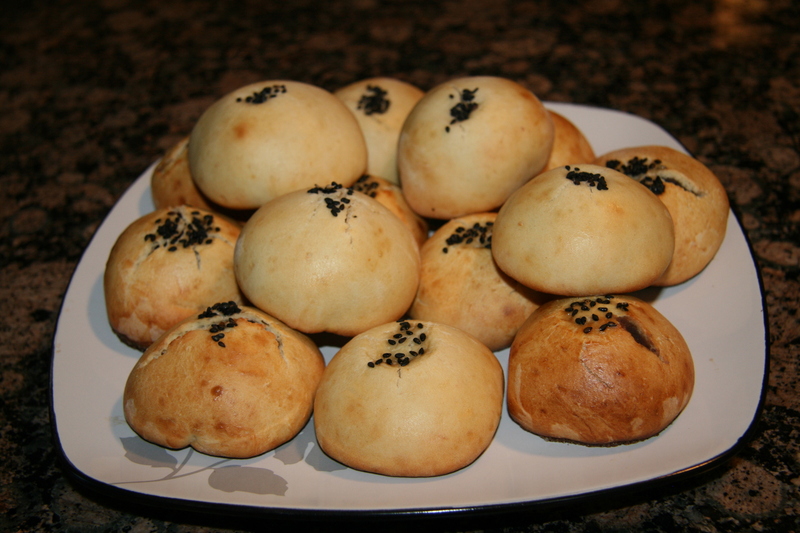 A baking challenge was posted, asking people to make an east Asian bread and post the results along with a recipe. The judge is going to recreate all the recipes and choose the winner. I figured this was totally up my alley because I happen to LOVE Japanese buns and rolls. When John and I lived near DC, we used to go to Chinatown a lot. One of our favorite restaurants was this hole in the wall that probably broke all kinds of health regulations. But their food was SO good and they were SO cheap. The best part was they had these great Japanese buns behind their counter for $1 each. 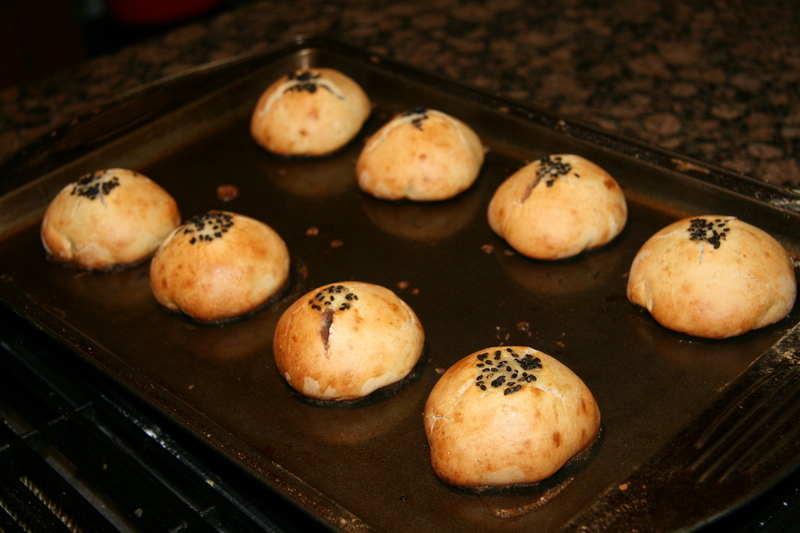 One of our favorites is the red bean bun, or anpan. I figured I would try this one for my submission. The red bean paste I made with my own recipe after browsing on the internet. For the dough, I used a recipe from Mamaloli.com a site for Asian recipes. I’ll give a few tips first, then post the full recipe at the bottom. 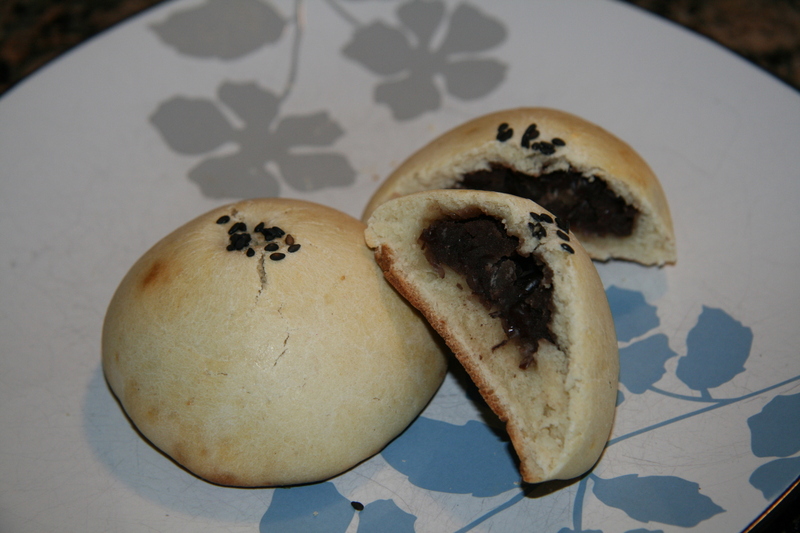 I found that making the red bean paste a few days early was the easiest. You can store it wrapped in plastic wrap for a week in the fridge. Soak the beans for 3 hours before cooking them to make the paste. The paste is very easy, and you can use honey, brown sugar, white sugar (or a combination) to sweeten it. I used a combination of honey and white sugar. I didn’t have any brown sugar, but I’d love to try it the next time I make it. 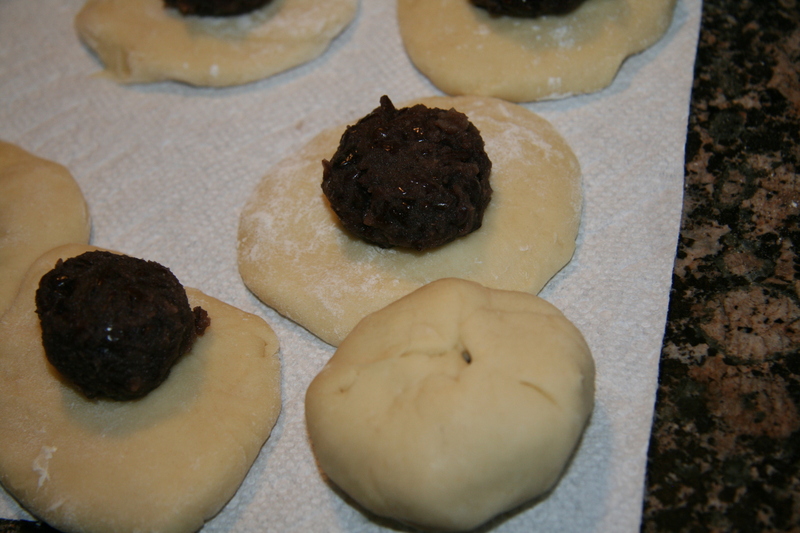 To shape the buns, take the flattened dough in your palm and place a ball of paste in the center. Then pull the dough around the ball of paste and pinch it shut. Make sure it is completely closed so the paste doesn’t leak out when baking. To make them shiny, I used an egg wash and then added sesame seeds to the top before baking. 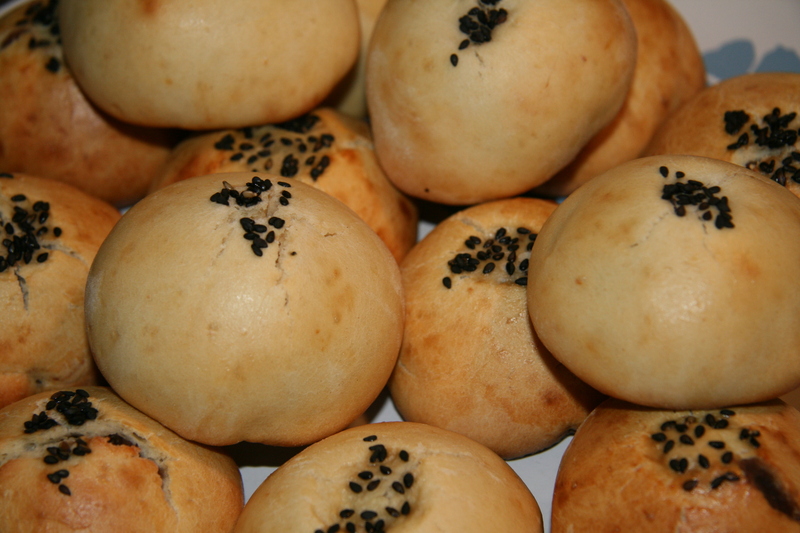 As you can see, before the egg wash, I put a thumbprint in the top of each bun to hold the sesame seeds. Nice and shiny and golden! These are really fun to make, and even more fun to eat! We enjoyed them for breakfast this morning 🙂 A nice twist to the usual winter comfort food! Place the beans in a bowl and cover with water. Let soak for 3 hours. Drain the beans and place in a pot. Fill with water so that it comes an inch above the beans. Bring to boil and then cover and simmer for 1 hour and 10 minutes. Drain the beans and place back into the pot. Add the honey and sugar and stir until combined. Mash and let cool for 15 minutes. Boil uncovered for 5 minutes to remove excess water, until the paste has the consistency of re-fried beans. Transfer to a bowl and mash again until smooth. Mix the flour, sugar, salt, and yeast together. Then add the water, milk, and beaten egg to form the dough. Add the melted butter and mix for about 5 minutes, until the dough is smooth and elastic. Oil a bowl by putting a few drops of olive oil and spreading around with a paper towel. Place the dough in the oiled bowl and cover (you can use a towel or plastic wrap). Let rise in a warm place for 1 hour. 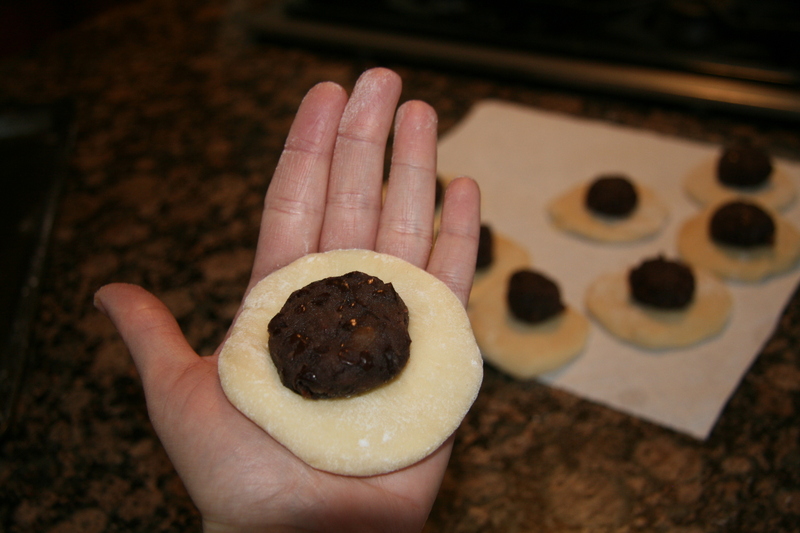 Split the dough into 8 equal-sized balls and place on an oiled cookie sheet. Cover with plastic wrap and let rise for 15 minutes. With floured hands so the dough doesn't stick, gently flatten each ball of dough. Place a TBSP-sized ball of red bean paste on top of the dough and shape the dough around the paste until it completely surrounds it. 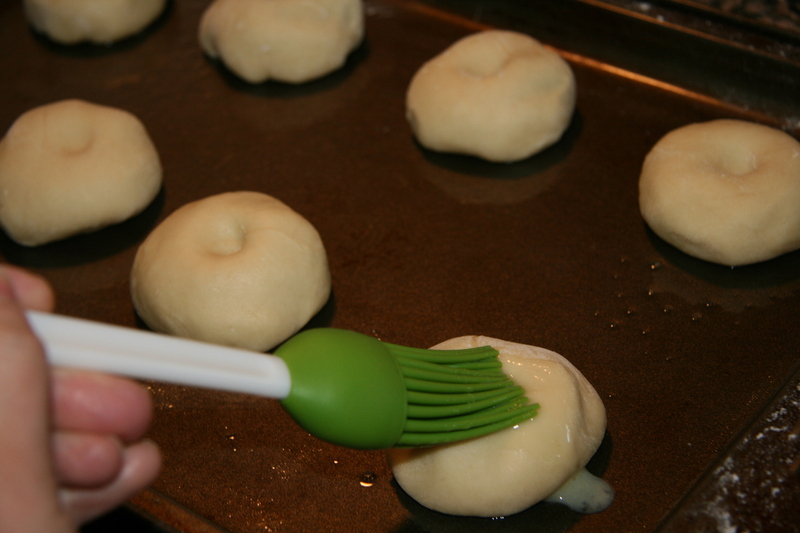 Pinch together and place the bun (pinched side down) on a cookie sheet sprayed with Pam cooking spray. Once all the buns are formed, gently place a thumbprint in the center of each bun. Combine the beaten egg and water for the egg wash. Brush over the entire bun. Then spoon a few black sesame seeds into the thumbprint. Bake at 375 degrees F for 15 minutes, until golden.